The ADXL001 is a major advance over previous generations of Accelerometers - providing high performance and wide bandwidth. This part is ideal for industrial, medical, and military applications where wide bandwidth, small size, low power, and robust performance are essential. By Analog Devices, Inc.
ADXL001 Pinout will be updated soon..., now you can download the pdf datasheet to check the pinouts ! 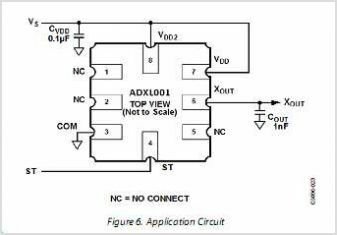 This is one application circuit of ADXL001,If you need more circuits,please download ADXL001's pdf datasheet.